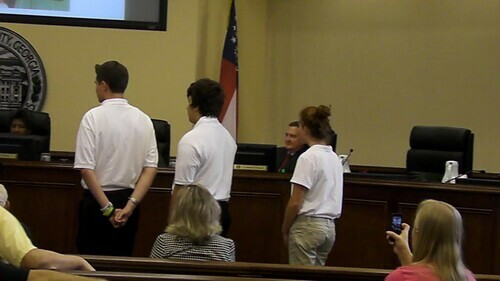 Here's an interesting presentation by a group of 4-H people to the Lowndes County Commission in their Regular Sessino of 11 October 2011. Hm, first they said the pledge, and what's that I see? Why look, it's a camera! What seems familiar about that location? News so good, there's a law against it! I'd like to thank the Commission for the award! I and LAKE will wear it proudly. The VDT doesn't have one of these. WCTV doesn't have one; WALB doesn't have one. Only LAKE posts news so good, there's a law against it! It's now been a week since the Lowndes County Commission passed an ordinance for no stated reason, not on the agenda, and not read to the public. It's still not on the county's online list of ordinances. Gretchen was covering an event Friday at which she saw Commissioner Crawford Powell; she asked him to send her a copy of the ordinance. Five days later, nothing has arrived. So, our only clues are Commissioner Raines' remarks that it had something to do with videoing and photographing. And his remarks that he believed that the Chairman could do it on his own, but he'd like to make a motion for the Commission to approve it. He didn't say anything about still photography, or for that matter about digital videoing, so I don't know whether what he said had anything to do with whatever it was that Commissioner Raines moved Tuesday and the Commission approved. Nor does anybody else know. William Branham talked about solar initiatives he's involved in and a variety of public officials he's talked to who are positive on solar and renewable energy for generating jobs. He pointed out that solar grew faster than any other energy source. He mentioned the Chamber's Renewable and Sustainable Energy Network (of which I am also a member). After Branham spoke, Commissioner Raines cited one solar company that had failed together with financing concerns and indicated he didn't think it was time for solar here. I don't agree with Commissioner Raines. What do you think? No, not every intemperate outburst! We can't be everywhere. 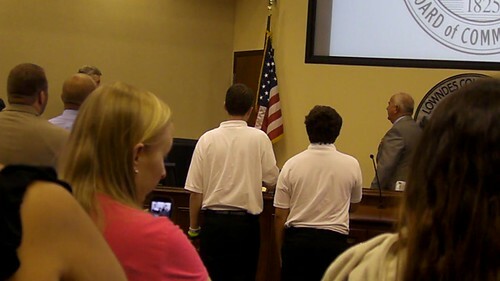 Just the outstanding ones from the podium as chairman in County Commission meetings. You're looking at him. Me. "I was the sheriff sixteen years; I locked up some of my best friends; that's the way I operate." Commissioner Powell wanted to know if County Planner Jason Davenport had sent these changes out to any engineers or developers to see if they had any concerns. County Planner said some of them had been on the mass email that he had sent, in addition to the notice in the newspaper, plus he had called surveyors' offices. Commissioner Powell seemed satisfied. Commissioner Powell wondered whether it would be best to send it back to the Planning Commission first. Commissioner Evans said it was her understanding that the Planning Commission wanted it to come back to them. The County Planner said he thought they would enjoy seeing it again, but they might understand not making the applicant waiting another 30 days, so he wanted to talk to the applicant one more time first. Commissioner Powell wanted to be sure there would be documentation in the file so if something came up ten years down the road they'd know what went on. Chairman: Yes sir, we uh independently; I will submit the chairman without the Commission ... do not question my authority. Chairman: Commission doesn't have to. Chairman: You're looking at it. Chairman: Mr Quarterman, I will not argue with you. Do not film except in the media area. Do you understand me? Don't say you weren't aware of it. It's on the web site.